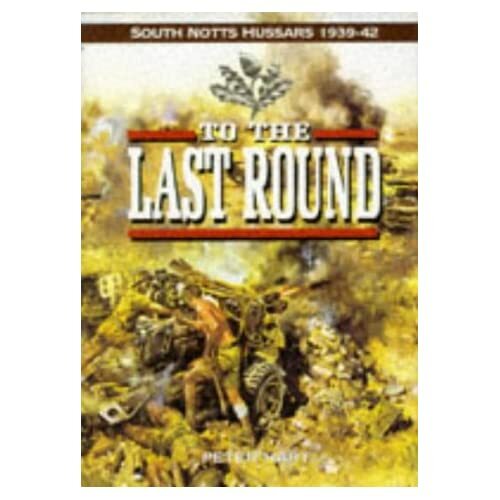 To the Last Round is an oral history of the South Nottinghamshire Hussars (107 Royal Horse Artillery) by the Imperial War Museum’s oral historian, Peter Hart. Like his other books this is very readable, and very strongly focused on giving a voice to the men who served in the regiment during the war. The book starts with the beginning of the war, and takes the reader through to the 6 June 1942, when the regiment was overrun by German tanks at the ‘Cauldron’. The book is primarily based on the interviews with the men, which are well woven into a relatively sparse narrative about the campaign. The focus is always on the personal experience. While there are some errors in the overall narrative (such as ascribing the first name ‘Clive’ to General Claude Auchinleck), these do not detract from reading. Where the book stands out is in the insight it gives the reader about the conditions in occupied Tobruk, from the boredom of being in a fortress under siege, to the terror of constant bombardment. There are a number of photos, with most of them portray photos of the men who were in the regiment. The book ends on the Gazala battles, where many men of the regiment died firing their guns to the last moment, in a heroic but pointless last stand. I can not recommend this book highly enough to anyone who wants to know what the war in the desert was like for the men who fought it. There are two interesting stories connected to Ray Ellis, who was with the regiment at Tobruk, and during its last battle at this and this link. This entry was posted in Book Reviews and tagged Book Reviews, Commonwealth forces, Royal Artillery, Tobruk. Bookmark the permalink.